I was so glad when Katie of Thank You, Ok agreed to guest post for me! I've mentioned her a few times on this blog, and I'm happy to report that we have become pretty good pals over the past little while. She's definitely one of my favourite people to share wine & cheese with and to take lipstick advice from. She just got back from a dreamy trip to Paris, the lucky girl! The year I lived in Seoul I spotted this little smiling cat everywhere. 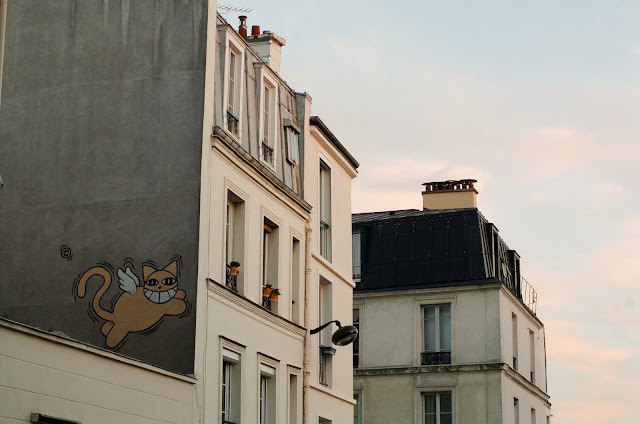 Then, this past week while I was visiting a friend in Paris, I was so pleased to see the same cat grinning back at me from the side of a building in Montmartre. As it turns out, the artist, Thoma Vuille, is from France, and there are over 60 of these cats across Paris. I wonder if there are any in Toronto. 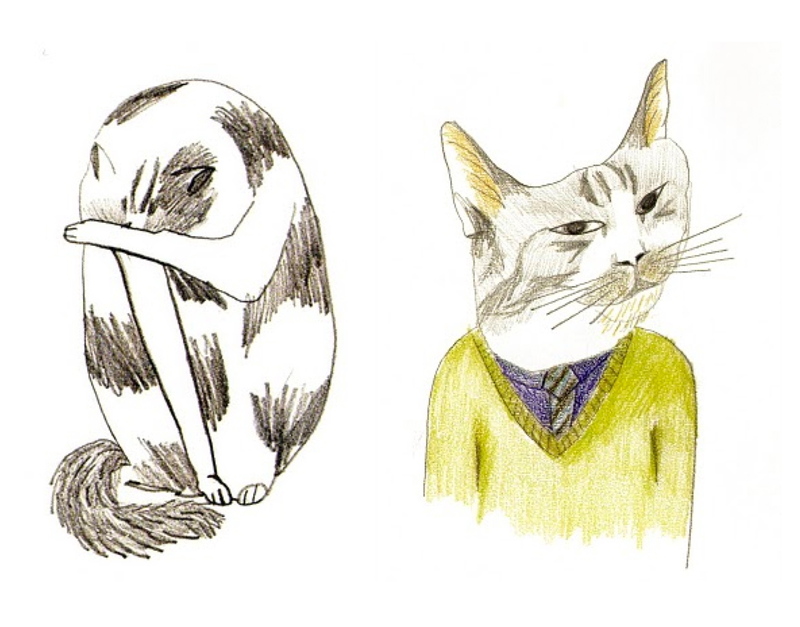 Here are some really sweet drawings of cats by Korean illustrator Jung Eun Park. I'm a big fan of Jung's and have talked about her before over on my blog, but thought they would be fitting to share with Anabela's readers. The drawings are of her cat Cicciolina, and they are from her zine of the same name. If in Seoul, you can find her work at The Book Society or you can order them online at Little Paper Planes. Speaking of cats, here's a petite chat that was trotting amongst the flowers in the beautiful Luxembourg Gardens -- what a life! monsieur chat! he's good to put a little smile on your face! Wonderful pictures, thanks for sharing them with us katie! I saw that smiling cat everywhere when I was in Paris! Thanks for posting more about it! how funny, i saw one of those cats when i was in Bosnia of all places! 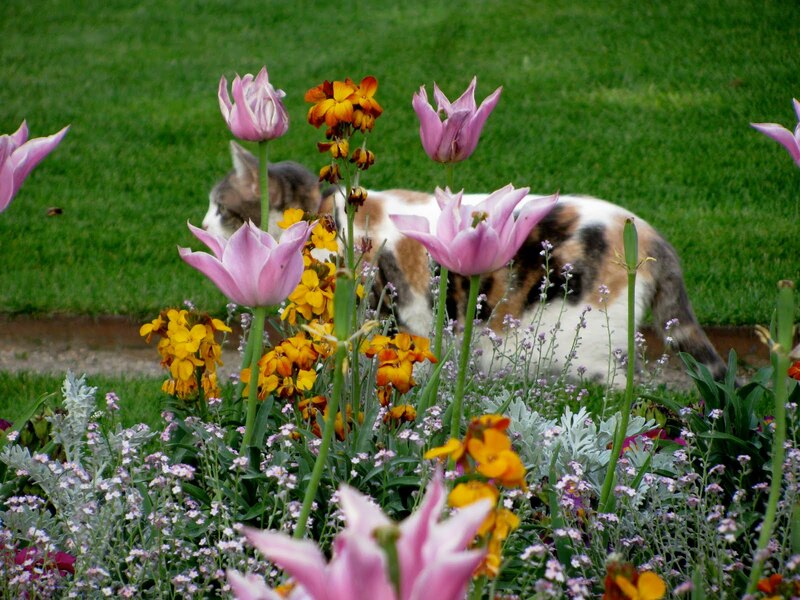 i can never get enough of cats, art and flowers. all together. extra happy! funny. I never knew about this. but ever since I was a leetle girl in my parents car driving from la to the 'burbs I noticed these grinning cats painted on the cememt in the la "river." didn't know this and how fun to try spot these all over major cities (like where's waldon irl). 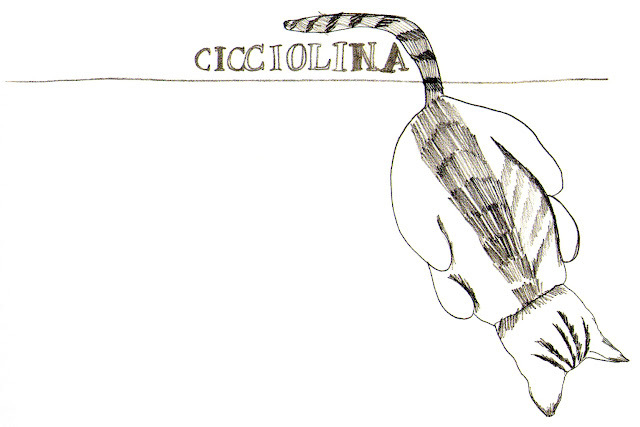 And thank you for your efforts on this beautiful blog!